Project Spartan doesn't have a final name, or a full set of features yet, but Windows Insiders testing Windows 10 can now try out the first, very rough version of the browser Microsoft is positioning as a break from the past – and a showcase for Windows 10 features like Cortana and account syncing. The split between IE and Project Spartan is now much clearer. IE will continue to be in Windows 10, where you're used to seeing it. It's where both enterprises and consumers will turn when they want IE features – like the Silverlight plugin or a toolbar that lets them earn points on an airline website. IE will be on PCs, and enterprises can use Group Policy to make IE the default browser on their PC. 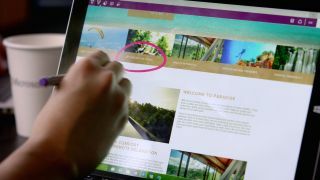 But IE won't appear on Windows phones - and it's not clear quite where small tablets will fall on the line between what PCs get and what phones get. Microsoft's Joe Belfiore confirmed earlier this year that tablets smaller than 8" won't get the Windows desktop or run Win32 apps, unless they've been upgraded from Windows 8 - in which case you'll get to keep the desktop. A similar policy for whether or not you get IE seems likely. IE keeps the Trident engine and all the plugins, toolbars, ActiveX controls and other extensions of the familiar browser, along with the mix of document and compatibility modes to handle sites that try to use features from specific versions of IE, in the familiar interface. But Spartan gets a sleek and simple new interface, and the new browser rendering engine called Edge, that started as a copy of the Trident engine but has had large amounts of code removed. That's not just things like toolbars, browser helpers and ActiveX support, or quirks mode and backward compatibility all the way back to code added to support web pages written to handle bugs in Netscape Navigator; it's also Microsoft-specific prefixes for CSS. The only Microsoft-specific prefixes are for features that are still being developed or where there aren't any W3C standard or WebKit prefixes to use instead. So far, you've been able to use the Edge engine inside IE in Windows 10, if you turn it on as an advanced feature. That option is gone in Build 10049. And Microsoft is keen to get Windows Insiders to try out Spartan and the new features. When you install Build 10047, Project Spartan will be pinned to the taskbar and the Start menu – and IE won't. If you upgrade from a previous Windows 10 build where you had IE pinned, the icon won't go away but if you're just trying Windows 10 for the first time, Project Spartan is what you'll see. This build doesn't have all the features Microsoft showed off in January, and it doesn't have some fairly basic browser features in the uncluttered new interface either; there's no browser history, for example, and the download manager isn't functional. Cortana is built in to Spartan, but she doesn't have the more pro-active features. If you right-click on some content in a web page you'll get any relevant information Cortana has and you can type a city name or a company to see the weather or a stock quote, but if you visit an airline page you're not going to get a reminder of the flight your friend has mailed you about.